To ensure a better game experience, we are performing an update from Nov. 14th 2:00 to Nov. 14th 5:00 EST. During this time you will not be able to log in. The duration time is an estimate and may be extended due to technical issues. We really appreciate your patience and understanding. 1. New SSR Miketsu Has Arrived! After taking time for preparation, the new SSR Shikigami Miketsu is about to arrive in Heian-Kyo! As the goddess of wishes, Miketsu is determined to bring hope and happiness to people. After the update on November 14th, Miketsu can be summoned by Mystery Amulet, Jade, AR Amulet, and the shards can be collected through Demon Parade and Wanted Quests. After the update on November 14th and until November 23rd 23:59 EST, Miketsu will have 2.5 times summon chance up! Note: Once Miketsu has been summoned during the event, the summon rate will revert back to the normal rate. 2.Welcome to my Tavern! New SR Nekomata is coming! After the update on November 14th, Nekomata can be summoned by Mystery Amulet, Jade, or AR Amulet, and the shards can be collected through Demon Parade and Wanted Quests. Besides, the Miketsu and Nekomata will be in Royal Battle, come to join and pick them to fight for you! 3. Inari Shrine Story is online! Want to know more about Miketsu and Nemomata? Here the story for them is coming for you. After the update on Nov. 14th, a short manga describes the story of them. Shichi-Go-San (Seven-Five-Three) is a traditional festival in Japan for girls of 3 and 7 years old and boys of 5, to celebrate the well-being of children. Families celebrate by dressing up children and visiting shrines across Japan from the end of October through the month of November. Heian-Kyo will also be celebrating Shichi-Go-San, so please join, enjoy the childhood time and get your reward! - There will be a total of 7 levels in this event, submit the required amount of candies (Golden Candy or White Candy) to proceed to the next level. - Clear a level to chat with SSR Shikigami and obtain a reward including Realm Cards, etc. - Clear all levels to receive clear rewards such as mystery amulets, skill daruma shards. - After the event, candies that are leftover will be converted into coins and sent via mail. 5.Dive into the Secret Zone of Umibozu "Tender of Sea"! - "Tender of Sea" secret zone has 10 levels in total. It can only be challenged in solo and players can challenge the same stage repeatedly, with every challenge consuming 3 AP. - Clearing a level for the first time rewards the player of corresponding rewards. Please refer to in-game information for further details. - Successfully clearing the 10th level for the first time will reward Umibozu's new skin "Deep Sea Terror". 6. Feed the Gluttony Ghoul! After the maintenance on November 14th, 2018, "Gluttony Ghoul" will be there to clean up your souls by devouring them! - Gluttony Ghoul can be accessed through the Souls Sorting Section. - Gluttony Ghoul will devour souls that are tagged as no use regularly and store the corresponding amount of EXP. - Players can edit its “Eating Habits” to decide souls of what grade to be automatically devoured by the Gluttony Ghoul when obtained. - When you log in to the game, Gluttony Ghoul will eat the souls which have past that time period. - Gluttony Ghoul does not eat Cyan Imp, grade 6 souls, or souls that are higher than level 1. Gluttony Ghoul also does not automatically eat grade 6 souls. - When using the EXP stored to level up souls, only the EXP stored will be spent, the Gluttony Ghoul itself will not disappear. - Gluttony Ghoul can only store EXP up to 99,999,999. after that Gluttony Ghoul can no longer devour any souls. - Gluttony Ghoul cannot be used to level up Totems. After the maintenance on November 14th, Miketsu's new skin “Bountiful Harvest” and Nemomata's new skin "Jingle Bell" will be available for purchase in skin store. There will be a 20% discount for the first week, don’t miss out! Get Miketsu’s realm skin “Fox’s Defensive Realm” after the maintenance on November 14! To purchase this skin, please proceed to Kohaku within the realm. 9. Miketsu and Nekomata Loading Picture! Added an update default pictures of Miketsu and Nekomata, and the previous update default loading pictures "Happy Halloween" and "Tamamomae" is available to buy in the mall. After the update on Nov. 14th, you can review the memory scrolls of Tamamonomae in the courtyard. Please tap the tree in the courtyard to check out! 11. New Packs on Sale! ・ Totem zones: When auto mode is enabled, each challenge reduces the Feed Limit by 8, regardless of the stage. ・ Sougenbi zones: When auto mode is enabled, each challenge reduces the Feed Limit based on Greed/Anger/Foolery zone by: 4/6/8. 2. Optimized upgrade process in the promotion menu. Max-level Daruma won't be auto-selected as upgrade materials when you continue to promote. 3. Added an animation to the evolved Ootengu in the Shikigami menu. He can now take his mask off when you tap on him. 4. Optimized the special effect of Oitsuki's Jade Tsuki skin. 5. Optimized Area Boss challenges. Players can now access the Area Bosses via Top in the Area by tapping them on the Personal page. 6. Simplified daily wish-making. 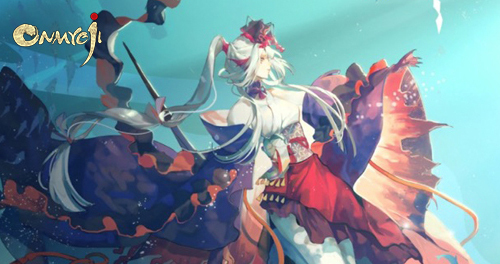 Players can no longer make wishes for the skin shard of a cross-over shikigami skin they already own. 7. Added "Area Boss: Conquer the World mark" in the Area Boss: Conquer the World rewards. 1. Fixed an issue that caused models to sometimes appear abnormal when players redirect to the Shikigami menu after being defeated in Area Boss challenges. 2. Corrected the inaccurate descriptions in some of the Demon Quizzes and changed the incorrect answers. 3. Fixed an issue that caused the visual effect of Tamamonomae's skill Soul Burst to go through the target. 4. Added the missing description "effective exclusively" to Hana's skill Painting Realm regarding its ability to negate controlling effects at the cost of birds. 5. Added the missing description to Sesshomaru's skills Meido Zangetsuha and Bakusaiga, stating that the inflicting of the Fractured mark is affected by Effect HIT. 6. Added the missing description "when inflicted with a controlling effect while under no controlling effects" to Hozuki's skill Full Control, regarding the effect that triggers at the end of his turn. 7. Added a missing description to Kiyohime's skill Venom Frenzy, stating that "Multiple Kiyohime cannot reduce DEF further than the limit." 8. Fixed the incorrect description of Kingyo's skill Goldfish: Aid, changing "non-transferred damage" to "single-target damage". 9. Added the missing description of Enenra's skill Smoke Phantom, stating that the damage of the second attack also increases as the skill levels up. 10. Added the missing description of Hako Shoujo's skill Glittering Shield, stating that the inflicting of random debuffs is affected by Effect HIT. 11. Added the missing description "if her passive skill is not disabled" to the description of Hiyoribou's skill Nourishment. 12. Added the missing description "if she isn't unable to take actions" to the description of Juzu's skill Karma. 13. Fixed the incorrect description of the soul Mimic when viewed in battles. 14. Added the missing description "when inflicted with a controlling effect while under no controlling effects" to the description of the soul Dice Sprite.